For America to maintain its fragile role as the most innovative nation on earth, it must perpetually attract the world’s best and brightest. There will always be trailblazing engineers who stay in their home country, leaving the United States one notch below its potential. Yet, on the heels of comprehensive immigration reform, a new viral economic study claiming that there is no tech talent shortage has skewed the national discussion over why we need to aggressively attract high-skilled immigrants in the first place. An Economic Policy Institute study claims that there is a surplus of American engineers, and, as a result, has garnered national headlines in The Washington Post, The Wall Street Journal and The Atlantic for busting “The Myth of America’s Tech-Talent Shortage”. It has fueled protectionist critics who rail against the high-skilled visa system for a being a low-paying indentured servitude scheme to trap vulnerable foreigners into low-paying, exploitative companies. Below, I explain the Economic Policy Institute’s argument, its methodological shortcomings, and why there will always be a shortage of great workers. Both of these claims are true. 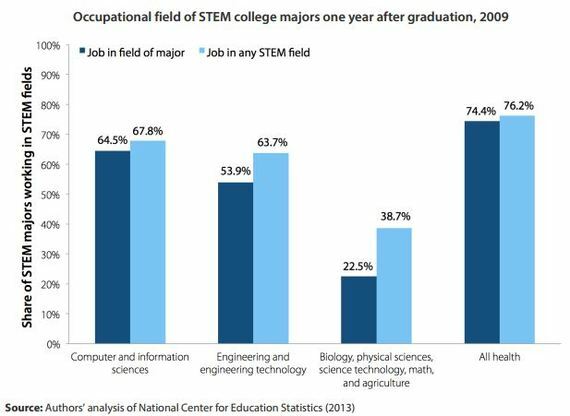 Roughly half of STEM graduates never take a job in the field, and 52% of of those who ditch a technology career do so for reasons related to pay, promotion, and working conditions. “For STEM graduates, the supply exceeds the number hired each year by nearly two to one,” write the authors. 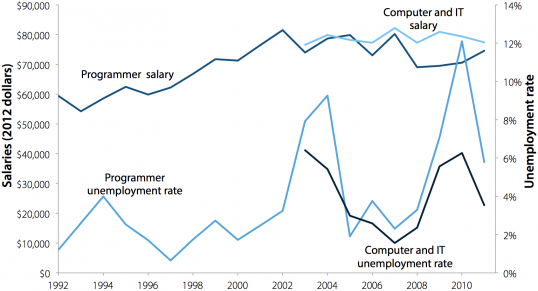 Perhaps more importantly, since the early 2000s, wages for programmers have virtually stalled. Yet, we know when there is demand for programmers in the tech industry, wages rise. Indeed, just prior to the Internet bubble, wages sky rocketed. Moreover, in one at least career with significant excess demand, petroleum engineers, wages rose a staggering 71%. In other words, STEM careers respond normally to the laws of supply and demand; if there truly was a dearth of programmers and engineers, we’d see wages rise. University of California, Davis Professor Norman Matloff, one of the fiercest critics of the high-skilled H1-B visa program, has argued that companies largely seek foreign workers for cheap labor. Under the current system, foreign workers need a sponsoring firm, allowing them to extort dreamy-eyed immigrants for lower salaries, who are threatened with immediate deportation if they lose their job. Almost half of the 85,000 high-skilled work visas are snatched up by shady consultant firms who are suspected of exploiting guest workers for cheap labor. Just last month, the FBI indicted a Texas IT firm, Dibon Solutions, for hoarding H1-B workers, paid only when contractors needed their service. Dibon “earned a substantial profit margin when a consultant was assigned to a project and incurred few costs when a worker was without billable work,” according to a government report. For guest workers, abuse, exploitation, and uncertainty is rampant. While it is true that the high-skilled visa system is flawed and there is a surplus of engineers, other researchers have found that the market does properly value immigrants, when they’re compared to natives of similar skill, education and age. The Economic Policy Institute averages all technology wages together, yet immigrants who uproot themselves from their homeland tend to be much younger, early career engineers (and, hence, lower paid). “Age differences appear to play a role and the H1-B advantage is greater once this is adjusted for,” finds a study from the respected Public Policy Institute of California. When comparing foreign to natives by age, occupation, and education level, immigrants earn about 13% more than their US counterparts. Not surprisingly, many immigrants, especially from Asian nations, have terrible English skills, which leaves them ineligible for higher paying managerial roles. “If all immigrants with an engineering degree had the proficiency of English–only speakers,” writes Rutgers professor Jennifer Hunt, “they would have conditional wages very close to those of natives (1.9% lower)”. Before journalists reprint studies, we should be cautious of non-peer reviewed analysis from “think tanks” with an obvious agenda. In response to the types of studies that showed the relative wages of immigrants and natives, Matloff lashed out at the H1-B system for perpetuating agism in Silicon Valley. “Employers prefer to hire younger, thus cheaper, H-1Bs instead of older, thus more expensive, Americans.” In terms of patents and academic work, he found, immigrants tend to be on par with natives, busting the so-called “best and brightest” myth. In order to protect American workers, he argues, visas should only be granted to select immigrants. While a large labor dataset of wages may show relatively equal economic value between natives and foreign, it ignores all ways in which immigrants contribute to American innovation. TechCrunch contributor Vivek Wadhwa has found that 24.3% of engineering and technology companies had at least one foreign born founder, employing 560,000 workers who contrbuted $63 billion in sales (just in 2012). How can so few foreign works make such a big impact? They’re responsible for founding a litany of household name companies, including Sun Microsystems (Vinod Khosla), Google (Sergey Brin), PayPal, SpaceX, and Tesla Motors (Elon Musk). In some ways, the immigration system is a lottery: most immigrants won’t add much more value, but every so often a genius comes along that justifies thousands of average workers. This is precisely why Congress is now considering the creation of a new “startup visa”, which permits immigrants to found companies without being shackled to an employee sponsor. There doesn’t appear to be limit on the number of immigrants who qualify for the startup visa, because it’s best to assume that America is always at a shortage of brilliant foreigners who could start the next Google or Paypal. But, of course, it’s not just founders; Berkeley Researcher AnnaLee Saxenian found that one of the secrets to Silicon Valley’s success was immigrant cultural groups, who mentor new arrivals and develop lucrative ties with their family and friends around the world. These highly skilled emigrants are now increasingly transforming the brain drain into “brain circulation” by returning home to establish business relationships or start new companies while maintaining their social and professional ties to the US,” she writes [PDF]. Global benefits like these aren’t captured in wage data because workers won’t always reside in the U.S..
As a corollary, modern employers aren’t just looking for an adequate employee — they’re looking for a worker who’s at least as good, if not better, than everyone else their seeing around the world. “Jobs postings will be listed for months without finding a good candidate,” explains former Zynga software engineer and founder of Appurify, Rahul Jain, to us in an email, “we need the best of the best”. It’s no shock then why the high-skilled worker visa cap was maxed out this year in a record 5 days. This kind of employee motivation isn’t captured in the Economic Policy Institutes wage data, because startups may not be able to pay foreign workers more; rather, they’ll just wait months to the perfect fit, if the position gets filled at all. Matloff and his fellow critics may be right that the guestworker program needs fixing. It’s exploitative and corrupt. But when the goal is to be the most innovative country on the planet, we’ll have a tech talent “shortage” until every single trailblazing founder, and their hyper-passionate friends, works in the U.S.
American can never get enough brilliant innovators.